August 31, 2009  Researchers say they have produced the world's smallest laser — a thousand times smaller than the diameter of a human hair. Scientists hope they can be used to create even smaller and faster electronics and to study human cells. August 29, 2009  In southeast Wyoming, there's a death match going on between the amphibian chytrid fungus and the Wyoming toad, one of the most endangered amphibians in the U.S. Observers had expected the fungus to kill off the species, but, while many toads have died, the population is slowly growing again. August 28, 2009  Mahmood Shivji, a professor of conservation biology at Nova Southeastern University and director of the Guy Harvey Research Institute, analyzed the DNA of more than 150 fish served at restaurants, and found many of them secretly substituted a cheaper fish for one advertised on the menu. Shivji says he finds that the "restaurant fish CSI work" makes for a good teaching tool. August 28, 2009  Reporting in the Proceedings of the National Academy of Sciences, researchers write that women with higher levels of testosterone may seek riskier finance jobs. Study author Paola Sapienza discusses how hormones, not sexism, may explain the gender imbalance in banking. August 28, 2009  Chef Wylie Dufresne, the owner of New York City restaurant wd-50, experiments with food, literally. He has lab notebooks detailing what certain chemicals do to certain dishes. Science Friday stopped in to see him prepare his scientific spin on eggs Benedict. August 28, 2009  A new study says so-called "heavy multitaskers" have trouble tuning out distractions and switching tasks compared with those who multitask less. And there's evidence that multitasking may weaken cognitive ability. Stanford University professor Clifford Nass explains the work. August 28, 2009  Scientists say nitrous oxide is in line to become the leading threat to the ozone layer. In other news, researchers have swapped DNA between monkey egg cells, correcting certain genetic diseases in the offspring. NPR science correspondent Richard Harris runs through the new research. August 28, 2009  Not everyone is sold on alternative fuels as the solution to energy problems. Time magazine senior correspondent Michael Grunwald is a skeptic when it comes to renewable fuels. He tells Steve Inskeep instead of emphasizing alternative energy sources, the U.S. should focus on boosting efficiency and reducing consumption. August 28, 2009  Pending climate and energy legislation puts a lot of stock — and money — into switching from fossil fuels, like coal and oil, to renewable energy such as wind, solar and ethanol. But some new analysis by environmental experts shows that alternative energy comes with some stiff penalties. For example: Energy Sprawl. August 28, 2009  A new study reveals that a byproduct of farming is devastating the ozone layer. 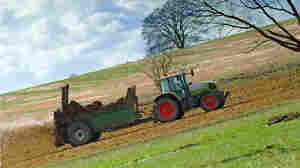 Nitrous oxide, also known as laughing gas, is produced when fertilizer soaks into the soil or water. Researchers say lessening the impact of nitrous oxide on the environment may be nearly impossible as global food demands increase. August 27, 2009  As huge wind farms get up and running to generate electricity on mountaintops and in fields, another market for wind energy is also emerging, known as "small wind." These turbines provide clean power to single homes and businesses, but are they economical?